At the beginning of the decade, George Whitesides helped rewrite the rules of what a machine could be with the development of biologically inspired “soft robots.” Now he’s poised to rewrite them again, with help from some plastic drinking straws. Inspired by arthropod insects and spiders, Whitesides and Alex Nemiroski, a former postdoctoral fellow in Whitesides’ Harvard lab, have created a type of semi-soft robot capable of standing and walking. The team also created a robotic water strider capable of pushing itself along the liquid surface. The robots are described in a recently published paper in the journal Soft Robotics. Unlike earlier generations of soft robots, which could stand and awkwardly walk by inflating air chambers in their bodies, the new robots are designed to be far nimbler. Though real-world applications are still far off, the researchers hope the robots eventually could be used in search operations following natural disasters or in conflict zones. The answer, Nemiroski said, came in the form of your average drinking straw. What they built, he said, is a surprisingly simple joint. Whitesides and Nemiroski began by cutting a notch in the straws, allowing them to bend. The scientists then inserted short lengths of tubing which, when inflated, would force the joints to extend. A rubber tendon attached on either side would then cause the joint to retract when the tubing deflated. Armed with that simple concept, the team built a one-legged robot capable of crawling, and moved up in complexity as they added a second and then a third leg, allowing the robot to stand on its own. While Nemiroski and colleagues were able to control simple robots by hand, using syringes, they turned to computers to control the sequencing of their limbs as the designs increased in complexity. 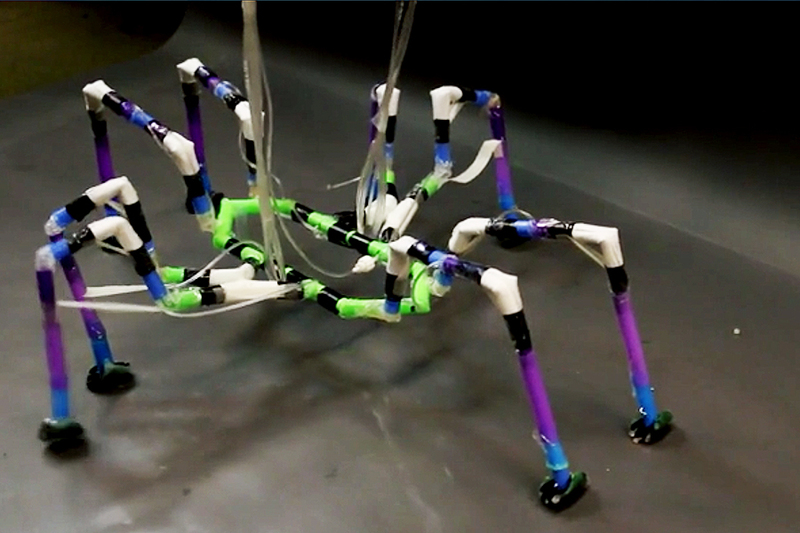 Though Nemiroski and colleagues were able to replicate ants’ distinctive “triangle” gait using their six-legged robot, duplicating a spider-like gait proved far trickier. Developing a system that can fine-tune the speed of actuation of the legs, Nemiroski said, would be a useful goal for future research, and would require programmable control over the flow rate supplied to each joint. Though it may be years before the robots find their way into real-world applications, Whitesides believes the techniques used in their development — particularly the use of everyday, off-the-shelf materials — can point the way toward future innovations. This post was originally published on The Harvard Gazette. Click here to view the original. This research was supported with funding from the U.S. Department of Energy, DARPA, the Natural Sciences and Engineering Research Council of Canada, the National Science Foundation, the Swedish Research Council, and the Wyss Institute for Biologically Inspired Engineering at Harvard University.